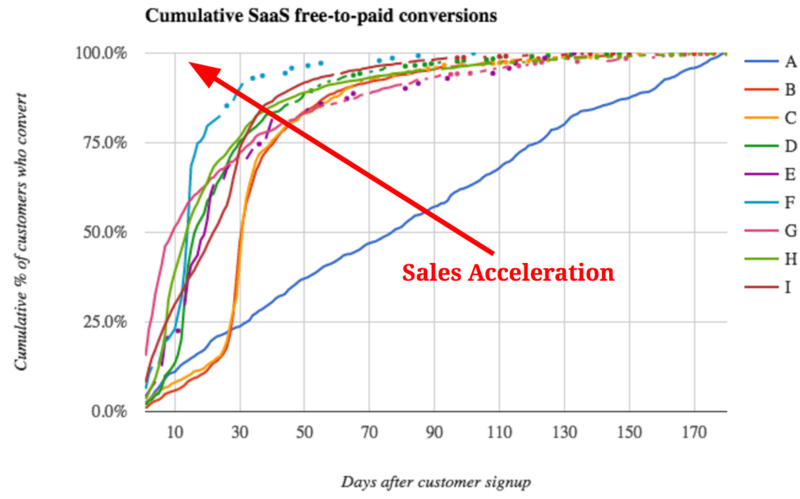 How Long Should Your SaaS Software Trial Period Be? How long should you let a customer use your software before they sign a contract? You could offer them a 7 day free trial. Or 14 or 21 or 30 or 90. Longer trials might be better. The customer could delve deeper into the product, become more committed and sign a larger contract. Shorter trials drive urgency, weed out the uncommitted, and result in shorter sales cycles. Both sides have compelling arguments. Unfortunately, most SaaS startups don’t have enough samples to reach a statistically significant answer. Anecdotally, I’ve heard from many marketers shorter trials are better. The team at MadKudu analyzed 9 companies with different customer acquisition and sales strategies. Their data showed conversion rates for most of these businesses follow an S curve. I’ve copied their chart above. Two have freemium plans (A & G); three have 14 day trials (D, E & F); four have 30 day plans (B, C, H & I). Longer trials do not convert customers at greater rates. In every case but one, 50% of customers convert within 30 days. In all but three cases, 50% of customers convert by the 14th day. In fact, as the original blog post states, it’s unlikely trial length has any meaningful impact on customer conversion rate. Other factors likely have greater impact. Things like the type of sales assistance: when do inside sales reps engage the customer? What types of conversion tactics are used to push customers to pay? How long are the contracts? Price points. And many others. Fleetmatix succeeded with two day sales cycles. In its early days, Salesforce discovered the 14 day trial was the optimal length. Company A in the data above has a linear customer payment rate. There are many differences here, and to date, we haven’t been able to understand the reasons why. I’m very curious about these factors and I’d like to run a large and anonymous survey to draw some broad observations about trials and the techniques that drive effective trials. If you’d like to participate, please fill out this form. My goal is to have 100 companies participate so we can reach statistical significance in these answers. If you’d like to contribute questions or help with the survey, please let me know that too.